A vertical tasting of Royal Tokaji wines was a highlight of the Pebble Beach Food and Wine event. Following World War I and II, as well as the rise of Communism, the wines were mass produced and the quality diminished. 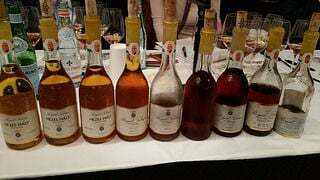 But, in 1990 Royal Tokaji was founded by wine writer Hugh Johnson and a group of investors who were inspired after the fall of Communism to restore and preserve Hungary’s wine legacy. Royal Tokaji owns 11 of the 22 hectares in Mézes Mály, one of only two vineyards in Tokaj to be designated a First Growth. In fact, Mézes Mály (which means honeycomb) is a Super First Class vineyard, meaning it is for the Royal table only. Mézes Mály is located on a south-facing slope, and the loess topsoil (wind-blown silt) results in wines with honey and floral characteristics. There are three grape varietals used. Furmint is the core of the wine. It is a thin skin grape, making it susceptible to botrytis and has the potential for high-level ripeness and good acidity. The other two varietals are Hárslevelü and Muscat for aromatics. Tokaji Aszú (meaning dried) wines is painstaking to make, like Champagne, Madeira, Port and Sherry. The berries require humidity, heat, wind and rain to create botrytis, which concentrates the sugars and acidity, creating new flavors. The berries are picked individually and only the best berries are desired (one man will pick only 22 pounds per day). In fact, to make 1 kilogram of Aszú berries can take up to 5 kilogram of healthy grapes. The Aszú berries are macerated with the base wine for 48 hours. The ratio of base wine to Aszú berries dictates the level of sweetness. This blend is placed in old oak casks to ferment for 3-6 months. The wines are then aged for a minimum of two years before final blending and bottling. Aszú wines can range from 1 Puttonyos to 6 Puttonyos. Traditionally, this indicated the number of Puttonyos (20 kilograms) of Aszú berries added to each 140-kilogram cask of base wine (or Gonci). Today the final classification is based on technical analysis of sugar levels. Royal Tokaji only produces 5 Puttonyos (120-150 grams of sugar per liter) and 6 Puttonyos (150-180 grams of sugar per liter) wines, as controlled by legislation. The wines from Mézes Mály are 6 Puttonyos. Royal Tokaji wines are not dessert wines. They are sensory experiences to be enjoyed with foie gras or cigars. As we tasted through the nine vintages, it was an unforgettable experience. The wines developed in the glasses resulting in extraordinary aromas. And, no matter how old the wine is, while the sugar seems to have decreased, the acidity has increased. The 1995 has nutty (almond) aromas and tasted like melted brown sugar. It has linear acidity, a long finish and amazing sapidity. The 1996 has smoky, iodine notes, as well as tarragon. There was an almost chewy, meaty quality about it. It is a wine you can almost see and feel and the flavor is like long gentle waves. 1999 was a vintage with the most botrytis. It has aromas of golden raisins and nougat. It is a full mouthwatering wine, almost creamy, with gentle acidity, like a little bright light sparkling in the distance. 2000 was a vintage with the least botrytis. The wine was like light brown sugar with honey and more mineral notes. Similar to the 2000, the 2003 is creamy with notes of caramel and a burst of acid. The 2005 was leaner on the nose with intense smoky and almost pine-like notes. The 2007 has aromas of dry tea leaves and honey. It is sweeter and the acidity is not as pronounced or assertive, resulting in a creamy, fruiter, richer wine. The 2008 vintage is a voluptuous wine with notes of chocolate cacao. This wine has great acidity and great aging potential. The 2009 is still a baby and is very youthful and playful. It is bright and fresh and the fruit notes really shine through. A tasting of Royal Tokaji like this had never been done before, and with the small quantities of wine produced this exact tasting may never be done again. Currently, 2013 is in barrel and will be the next vintage on the market. Perhaps there will be another of Royal Tokaji at some time in the future but it will be its own unique tasting of a lifetime. One can always dream.